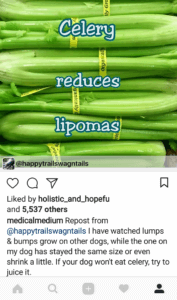 In part 1 of natural remedies to shrink lipomas, I discuss some alternative treatments for dog lipomas such as a few supplements that will stop lipoma growth, herbal remedies that can help shrink fatty masses, possible causes of lipomas and why you may NOT want to have surgery to remove benign tumors. In part two of this blog, I’ll discuss some diet do’s and don’ts and some herbs and spices that are thought to shrink or prevent lipomas. Eliminate these 3 foods to stop your dog’s lipoma growth in its tracks! 1) GMO foods: GMO’S aka genetically modified foods, act like a “fuel” for lipoma growth. Taking out all GMO’S will aid in the healing process. Some GMO foods are corn, canola oil, and wheat. 2) Eggs: Once I learned eggs feed viruses and promote cysts, tumors, and calcifications, I made sure eggs were not in any food or treats. 3) Grains: Going Grain-free can be beneficial to all dogs but especially for dogs dealing with benign tumors, dog eczema and Spondylosis. Why? Many grains, such as wheat, are no longer the same grains from decades ago. Today’s wheat is often referred to as “frakenwheat” and is a contributing factor to gut health issues such as IBS or colitis. 1) Celery: assists kidneys, flushes the liver, helps with acid reflux, heartburn, high blood pressure, blurry eyes and reduces lipomas. My dog drank 1-2 ounces of celery juice with me daily, sometimes he ate a celery stalk as a snack and it was generally a part of his meal. Celery juice Tip: if you don’t have a juicer to make celery juice, you can use a blender. My old glass blender struggled with celery so I bought this one and it has been so worth it. 🎉 It handles the job much easier and I get more juice out of the celery! After the celery is blended, I run it through a nut milk bag or something similar to get the juice. *Please Note: If your dog has never had celery juice before, please start slow or with a very small amount. Straight juice vs. the food with pulp, gets into the bloodstream much faster. 2) Wild blueberries: I covered this amazing fruit in my cancer blog and it is worth repeating again since it will also help with lipomas! These berries are little powerhouses that have the capability to repair cells and are great for eye health. If you can’t find wild blueberries, you can use this powder. Fruit Tips: If your dog is not good at keeping food in their bowl, stick them in the blender to make a smoothie for them to lick it up. Additionally, keep fruit separate from protein for the best results. 3) Raspberries: prevent benign growths and malignant tumors. 1) Chaga: can be purchased as a powder that can either be mixed in food or brewed as a tea. Tip: I did not like it straight in the water, I steep it in this. Chaga benefits: helps bring the liver out of stagnation (meaning it’s a gentle liver detox, which most dogs & people need), helps skin issues like eczema, nerve pain, strengthens red blood cells and bone marrow. It is considered anti-cancerous and fights tumors. 2) Burdock root: has anti-tumor properties, is a top cancer remedy being as it stops cells from metastasizing and is an ingredient in Essiac tea. It also helps with skin issues like eczema, is an effective painkiller, is anti-inflammatory and helps with urinary and bladder infections. This herbal remedy is similar to essaic with one exception. The traditional recipe includes Turkish rhubarb whereas this herbal remedy has Organic Chinese Rhubarb. 3) Parsley: neutralizes acidity in the body, fighting multiple myeloma, great for your eyes, is helpful in preventing tooth decay, removes herbicides, removes pesticides and will counteract grains. This organic dog supplement contains BOTH #3 and #4! 4) Turmeric: visit my cancer blog for dosage, additional benefits, and any contraindications. *Please note, dogs who “run hot” may be better off NOT taking turmeric. Instead, Violet would be a better choice to combat inflammation and lipomas since it will have a cooling effect on “hot” dogs. 5) Cumin: great for digestive disorders, has anti-cancer properties, anti-tumor properties and helps boost kidney & liver function. 1) Meat: feeding grass-fed meats will be best because it will help your pet avoid ingesting other toxins. If your dog’s diet is heavily based on animal protein, lowering the amount of animal protein a bit can be beneficial because it can stress the liver and kidneys. One way to accomplish this is to have Meatless Monday. When I make a Meatless Monday meal for my dog, it was made with quinoa and vegetables like kale, spinach, and sweet potato. Another option is if your pet eats a lot of meat-based treats like bully sticks or chicken jerky, trade the meat based treats for treats like this! 2) Grains: above I mention grains may be something you want to avoid altogether when fighting fatty tumor growth. However, if grains are part of your pet’s diet, the better choices are GMO-free quinoa and brown rice. My favorite type of rice is Basmati but you could pick another type such as Jasmine rice. Grain tip: Grains don’t “mix” well with animal protein so it’s best to keep them separate. 3) Vegetables: There has been some information claiming cruciferous veggie’s like broccoli are goitrogenic but one of my trusted sources says no. There are some pet cancer diets that use this vegetable as one of the main veggies in their pre-made meals. A few other vegetable choices are leafy greens like kale or spinach and another favorite is sweet potato. I hope this information helps you achieve the success I had in shrinking my dog’s lipoma. 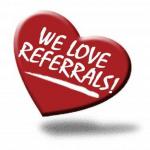 I would love to hear what strategies you implemented to reduce your pets non-cancerous lump!